In a city that’s become accustomed to seeing cold, hungry people living by the side of the road, at least a few people are still determined to make a difference. One of them is Kristine Moreland. “What’s that?” my visiting sister asked as we came off the I-90 freeway and headed south on Rainier Avenue. I glanced out the passenger-side window and took in what she was seeing for the first time, and what I had seen, but barely noticed: tents. About 20 of them, set up on a wind-swept rise between the freeway and the six-lane road. Blue tarps flapped, shopping carts sat packed with rain-soaked belongings — and I turned away. “That’s a homeless camp,” I said, flatly, far from the tone I used to point out the Fremont Troll and the Olympic Sculpture Park. My sister went silent, and I just kept on driving. 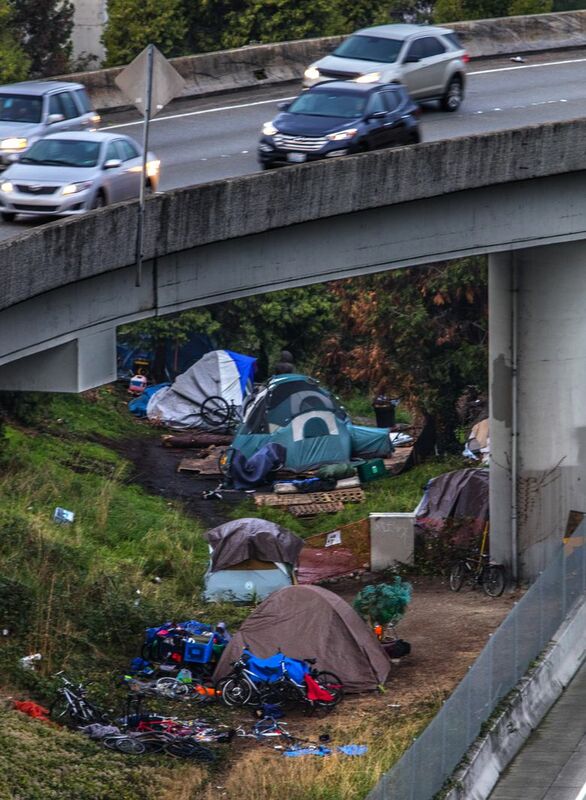 The sight of people living on the side of the road — be it in tents, in battered RVs, in stuffed cars with blankets over the windows — has become part of my daily routine, and Seattle’s cityscape. It scares me that I am so inured, so used to it. So cynical. Ten-Year Plan to End Homelessness? That went well, didn’t it? Nickelsville? Tent City? I’ve visited plenty, and will likely see plenty more. Kristine Moreland has beat many of us to it. Every Tuesday night for the last five years, the Kirkland mortgage broker has headed into Seattle’s homeless encampments, bringing food, supplies, hot cocoa and — unlike me — eyes that can’t look away. “My father was homeless my entire life,” she told me. He left when she was 2 and is still out there. Heroin and alcohol. In 2010, Moreland started a coat drive through her company, and started making regular stops at the Union Gospel Mission. The following year, she added turkeys to the donations. One day, the head of the mission stopped her: “You need to see where these things go.” He knew nothing of her background, her father. She wasn’t doing it because of her father. She didn’t go out to find him. In fact, she made sure to avoid the places where she knew he might be. We forget that, Moreland said, and assume that the homeless have chosen the paths that put them on the street. It’s true that homeless people are attracted to Seattle — in part because we’re a port city, but also because we have more resources for them than most large cities, and a generally liberal bent. But the reason we can’t handle the amount of homelessness in our city, Moreland said, is because we’re mishandling the resources we have, and the community is not doing enough on its own. In other words, we are looking away. Murray’s announcement was “an ah-ha moment for our community,” in that it makes the problem of homelessness a priority, Moreland said. Now, hang on, I told her. I care about the potholes. I’m trying to get to work so I can make money to pay for my house and food — and the taxes that pay for a lot of the services the homeless receive. Moreland got that. But she insists that the community step up, as Murray suggested. More importantly, she said, they need to know that they are loved. She told me about a homeless veteran named Frank and an addict named Detroit who both turned away her help. But she was consistent, she said, and over time they opened up and improved their lots. “Sometimes it takes the community telling them that they’re worth more,” Moreland said. We need to understand that these encampments are people’s homes, where they sleep and hold dearly everything they own. She thinks the city needs to install more porta-potties and garbage bins. “What I say to that is, you tell me what you would do,” Moreland said. “You can’t say anything until you’ve walked a day in their shoes. You just don’t know. “What gives you the right to judge?” she continued, then softened. “I live a fantastic life. What’s that song? ‘The Man in the Mirror.’ Take a look at yourself and make that change.